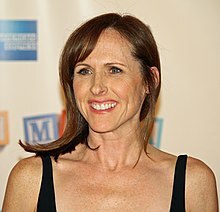 Molly Helen Shannon (born September 16, 1964) is an Emmy-nominated American actress and writer. If you're a woman who doesn't know how to write, you're going to cry every night. But if you do, no problem. When I was little I definitely was sad a lot and I used to dream. I used to get these obsessive crushes on non-available guys. Not any more, but that was my life for a long time. I think there's too much emphasis on beauty. I find it so limiting. I think just be yourself. Be who you are. Self acceptance is the sexiest thing to me. This page was last edited on 13 March 2015, at 17:52.